Contrary to popular belief, John F. Kennedy was not the first person to try to create the Peace Corps. 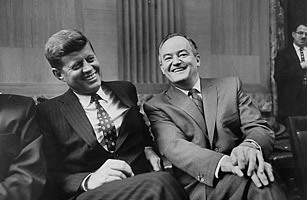 The first person to introduce a bill creating the organization was Senator Hubert Humphrey in 1957. Sadly, it didn't pass. Three years later, during his 1960 presidential campaign, Kennedy mentioned the idea again in a University of Michigan speech. He called the group the Peace Corps and, after he was elected President in 1961, he signed the executive order officially founding it. See photos of 1964 Peace Corps volunteers.